Did the baby have an accident in your car and you wish to freshen it up before getting it cleaned at the car wash? Do you get all sweaty when coming home but you don't wish to leave your scent in the car? Then you're in need of the best car air freshener around. So what type of air freshener is best for your needs? Adsorption: Not to be confused with absorption (fluid permeating into a solid or another liquid), adsorption by adsorbents like activated charcoal, silica gel, or zeolite can remove odors by adhesion of gas, liquid, or dissolved solid molecules to, for example, the charcoal surface. Oxidation: The organic sources of odors can be removed by oxidation using oxidizing agents like chlorate, chlorine, peroxide, hydrogen peroxide, and ozone (like putting bleach on the urine of pets). 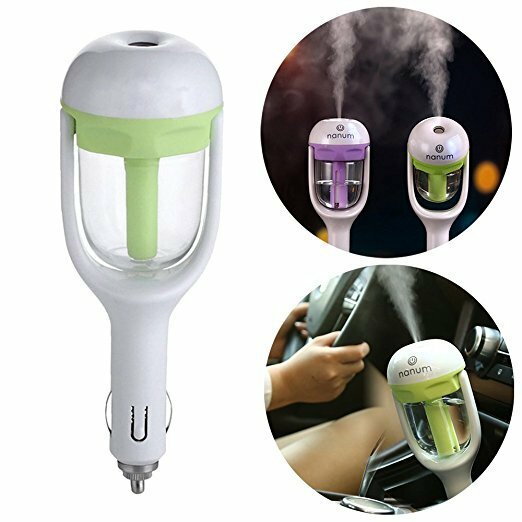 ​Air Sanitizer: If the odor in your car is because of airborne bacteria, air sanitizers can get rid of the smell by inactivating those germs. ​Masking: An odor can be overwhelmed by another odor, may it be strong perfume or something more pleasant. Diffuser Humidifier: A humidifier is a device that increases the humidity of a stuffy or dry place (like the inside of a car with the A/C on or the inside of a house during winter). Scented versions masks odor as well. Here are the top brands of car fresheners you should watch out for. Moso: Moso is a brand that led to the creation of the Moso Bag, a convenient and multipurpose car air purifier that uses charcoal adsorption to clear the air inside the vehicle (without using a cocktail of irritating chemicals). 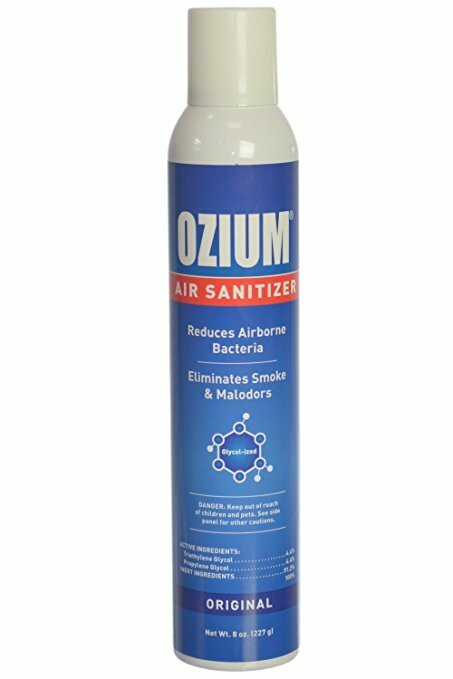 Ozium: They're the makers of deodorizing sprays, disks, and gels that you can place in small spaces. Their patented fragrance formula eliminates odor and replaces it with something more pleasant. 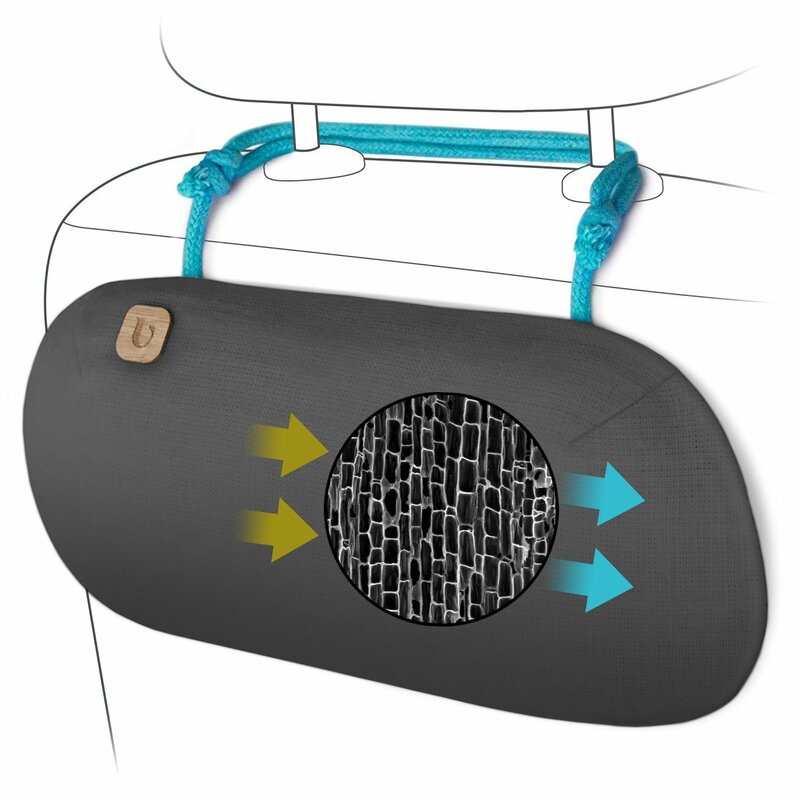 You can control the scent potency with the twistable top. ​Little Trees: The Ur-Example of car fresheners, Little Trees come with the emblematic cartoon pine trees that you hang over your rear-view mirror. Naturally, when talking about car fresheners, Little Trees are always part of that conversation. PURGGO: This brand makes deodorizers that get into the root of the odor problem, passively eliminating and absorbing odor unto itself in order to eliminate smells without strong, overpowering, and masking odors. You won't even need refills when you have one of their products. ​Chemical Guys: This company based in Southern California is a multinational one that specializes in making quality car care chemicals, machines, buffing pads, and accessories (including car air fresheners). It's been around for 40 years. Yeworth: Yeworth is another maker of various car care accessories and products, such as splitter patch cables, SVGA VGA monitors, charger adapters, headphones, electric fans, and fine mist humidifiers that improve upon the car microenvironment in more ways than one. Febreze: Like Little Trees, you cannot count the world-famous Febreze out when it comes to air fresheners. On top of providing car perfumes and deodorizers, Febreze also makes fabric conditions with strong scents, spray canisters to alleviate home odor, and the like. 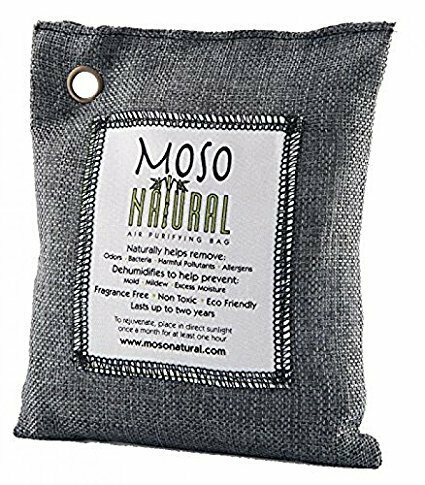 Rather than mask the bad odor of your car with the sweet scent of pine or some other flowery smell, the Moso Natural Air Purifying Bag eliminates odors. If your vehicle stinks so bad that your kids refuse to drive with you, then you can use Moso to bring them around. In fact, it's capable of preventing bacteria, mildew, and mold with its fragrance-free, chemical-free, and non-toxic way of eliminating bad smells. It has a 90-square-foot coverage that's more than enough to cover many a vehicle, even trucks and stretch limousines. It's even capable of absorbing excess moisture when push comes to shove. Aside from cars, it eliminates scents from closets, pet areas, and even bathrooms. It's an odor eliminator rather than an odor masker. It gets to the root of the problem rather than hides it. No overpowering sweet smells you might be allergic to. It absorbs smells unto itself the same way activated charcoal absorbs poisons in your body. It's pretty cheap at $10-$15 price range. It may not work on especially strong smells. You need to use it at an extended period of time to get rid of potent musk. At least odor maskers (or products that can neutralize and replace odors) work almost immediately. This is a $9-$10 value perfume-based odor masker and car freshener. This anti-bacterial air freshener attacks odor-causing germs and bacteria, making sure they're eliminated while at the same time it leaves a fresh scent to replace the bad ones left by any microbes. It's an odor masker but it's also a mix between that and a sanitizer. It's because it actually does something about the usual suspects when it comes to bad smells. Some customers even report it can get rid of skunk smell or marijuana smell better than a can of house air freshener. In terms of cons, it's a highly corrosive and toxic air freshener that can cause irreversible eye damage when mishandled. It also doesn't kill all smoke and airborne materials (although it covers quite a lot of scents). It doesn't indulge in false advertising or exaggerated claims. It's an extra strong car air freshener that does more than the average car perfume. It attacks bacteria and germs and replaces bad odors with good odors. It's a highly toxic and corrosive product. It's not returnable due to special handling requirements. It can cause irreversible eye damage so it needs eye wear when being applied. This is a more traditional car air freshener with the cartoon pine tree design and all. It's available in a variety of fragrances, but males in particular go for its masculine fragrances of lemon, bergamot, and sandalwood rather than anything flowery or girly. You can use this on the road or at home. It doesn't have a strong perfume smell but instead a pleasant one. It's technically more expensive than previous air fresheners that cost $10-$15 by costing around $15-$16. However, it's sold in bulk so you get more products for about the same value. It's subtle and non-overpowering but it can also serve as a deterrent of flies and other bugs from within your car or your home. It's even effective enough to deal with the smell of a chicken coop or an outhouse, so what more the inside of your car? It's really cheap and you can buy it in bulk. It's an effective fly deterrent. Works even better than horrible-smelling traps. It's made in the USA and has typical USA standards of quality. 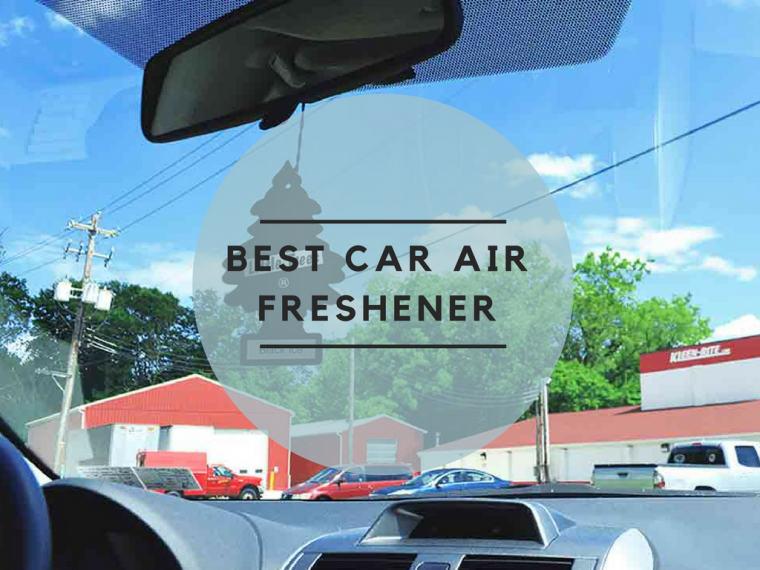 It goes with the traditional automotive air freshener format that's proven effective (and familiar). Certain scents aren't quite favorable. It takes multiple Little Trees to get a scent going. It's not long-lasting (lasts only a day at best or 30 minutes to an hour at worst) according to certain customers. If you wish to purge bad smells, then you should give PURGGO a shot. It lives up to its strange brand name by purging many different malodors without masking them with a scent. It's not an ionizer, scent bomb, gel, or spray. It contains no plastic, chemicals, or fragrance. It's instead 100% bamboo charcoal (with hemp) that absorbs any bad odor naturally. As bad gas and even new car smell (from volatile organic compounds) passes through the charcoal, the scents are absorbed and the atmosphere within your vehicle is purified. It gets quite the favorable response from customers because it's able to eliminate the odors themselves rather than hiding or replacing them. There are users who claim that after they installed it, they don't even know it's there anymore. They're just left with a scentless car. You'll smell nothing, or so these satisfied customers claim. It doesn't need pricy refills and is sustainable. It passively eliminates and absorbs odors unto itself. It gets rid of many embarrassing smells from your car (and elsewhere). It doesn't have overpowering cologne or perfume smells like other air fresheners. Some customers say it doesn't work at all. Judging by customer feedback, its Kryptonite is cigarette smell. Charcoal is unable to do anything about burnt tobacco scents. Consistently, the customers trying to get rid of cigarette smell have ended up rating this product low. Ironically, although some car users wish to get rid of new car smell because it's full of VOCs and it's nauseating, there are others who love it, thus explaining why Chemical Guys AIR actually emulates the scent (hopefully without using VOCs itself). It also comes in leather smell if you wish to get that odor instead. This enzymatic air freshener is a car odor bomb that reduces new odors and eliminates existing odors. It circulates through your A/C system and it works fine enough. It costs $16-$40 ($16-$20 for the 16-ounce bottle and $35-$40 for the 128-ounce bottle). It has a new car smell that is retained by your car for quite sometime. You can also dilute it with up to 2 gallons of (distilled) water because of how concentrated the solution is. It's a car odor bomb you circulate through the A/C. Customers agree it has strong new car smell retention. It has some of the more unique fragrances that you won't ever describe as flowery. It smells strong rather than pleasant. A definite odor masker. If you don't like an air freshener emulating new car smell (or if you're trying to actively get rid of new car smell), you won't like this product. Not everyone likes the new car smell fragrance, likening it more to a strong chemical or solvent odor. Rather than absorb bad odors through charcoal or mask them through special scents, why not humidify your car instead to reduce dry, stale air? The Yeworth Car Aroma Diffuser Humidifier works to mask bad odors with its own sweet scent while at the same time humidifying your car in light of its dry air from using the air conditioning and whatnot. Costing $11-$12, it's one of the more affordable humidifiers out there. It claims to reduce dust, remove harmful gases, decrease formaldehyde contamination, mitigate "radiation" from car electronics, and gets rid of static electricity. If you have a stuffy or dry car, then the best way to deal with it is through a humidifier that raises the humidity of your vehicle. 180-degree rotation from the humidifier and a no-leakage guarantee. It humidifies stale, dry air that could lead to respiratory complications. It has a 2-hour auto shut off to prevent potential harm from it running without water. It replaces stale air with humid and scented air through its diffusion of water and perfume. It doesn't work on strong smells. If you don't use it everyday, it stops working after two months of no use. More than a few customers complain about how easily the Yeworth Humidifier breaks down after a few seconds of usage. As expected of Frebreze, it has its own line of air fresheners that coincide with its world-famous all-purpose deodorizing spray canister. 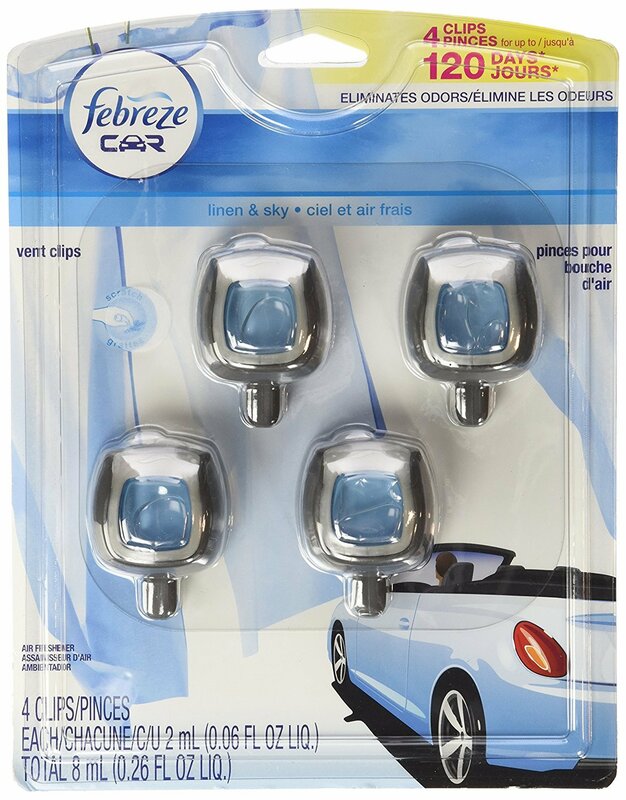 The product comes complete with a full package of 4 Febreze Car Clip Packs (Linen & Sky) that attaches to the vents of your car's A/C as well as the vents of your home. It's also relatively affordable at the $11-$12 range. Many customers love Febreze for its aroma. However, some rate it lower because of its false advertising. It doesn't necessarily last 30 days (a month) per clip or 120 days (four months) for the 4-pack package. It lasts 2 weeks or 14 days at best in its lowest setting even when you don't use your A/C a lot. The Febreze scents aren't overpowering. Instant smell removal. It masks the smell as soon as you spray it. It works excellently with cleanup in getting rid of the source of the bad smells. Affordability. You get four products showcasing the world-renowned scents of Febreze. It can only mask smells and the smells will remain until you do cleanup. It doesn't last very long. The four-pack product doesn't last for 120 days or 4 months. It's more like 42 days or 6 weeks (or a little over a month and a couple more days). Allergy-causing "fresheners" are typically the masking-type air fresheners that have allergy-inducing chemicals that provoke allergies and asthma symptoms. Get an air freshener with a pleasant rather than overpowering scent. From within the cardboard, there are many different scents and perfumes included. Air exposure spreads the scent excreted by the freshener. Soon, all free molecules are used up and you'll need to buy a new freshener within one to two months. Luckily, these fresheners come in packs and are quite affordable, valued at about a dollar each or more. The same reaction happens with baking soda when you use it to deodorize your refrigerator after it has undergone a defrost cycle filled with stale food smells and the scent of blood from the frozen meats packed on its freezer. Deodorizers mostly work by removing air molecules and releasing a more pleasant scent after it reacts to said molecules. As for ionic air purifiers, they're the only other type of air purifier that needs electricity to operate aside from the humidifier-type fresher. These ionic air fresheners or purifiers operate with interesting science. The negatively charged ions attract the positively charged (smell-inducing) molecules of the air, which grounds them upon contact (the same effect you get from static electricity). These devices mask the scent and are more concerned about making the dry air of your car more humid and healthy. Finally, charcoal air purifiers use the phenomenon known as adsorption in order to do scentless deodorizing wherein the odiferous scent is adsorbed unto the charcoal surface (usually made from charred bamboo or coconut). Which air freshener gets rid of cigarette smell? If you want to get rid of tobacco smoke (or even smoke from marijuana joints or bongs) a charcoal air purifier might not be the best choice. Ionizers, maskers, and deodorizers might be the better choices. Some activated charcoal products claim to remove cigarette smell but only if you don't continuously smoke inside your car as though it's your personal smoking area. It's best to use charcoal to eliminate lingering cigarette smoke within your upholstery. The smoke smell isn't lingering if you keep smoking though. Also, trying to use charcoal to get rid of smoking smells is akin to using flowers to get rid of flowery scents. It's not that effective from the get go considering the source. Do air fresheners work anywhere else other than your car? Yes, but some work better than others. A spray air freshener can work elsewhere in your home, but it can only travel at a car-sized area or else it will run out sooner than indicated. It's better to just buy a canister of Febreze than use your car freshener Febreze for your home. You can put your air vent clip-on with your home vent though. You can use activated charcoal deodorizers in your bathroom, litter box, or bedroom since they aren't fueled by refillable jars of perfumes but instead "absorb" (or adsorb) bad stenches unto them. The masker car fresheners usually have spray or vent equivalents you can use anyway. How long do air fresheners last? This depends on the air freshener. Deodorizing adsorption material like activated charcoal last for more than a whole year or 365 days. The bamboo or coconut charcoal will trap the odor particles through its cavities and pores until they fill up and make it less effective. As for air sanitizers, they can last as long as their ionizing or deodorizing ingredients are present. Ditto with the air vent clip-on and its liquid perfume or the Little Trees cardboard air fresheners. If you want a solid number, the Febreze 4-pack claims to last for 4 months (although it's really more like a little over a month). Where should I place my air freshener? The Little Trees product is famously placed over the rear-view mirror (in some third-world countries, they place flowers along with their evergreen cardboard cutout air freshener). Obviously, the air vent clip-on is placed directly on the vent itself. Sprays can be placed in your dashboard drawer, ready to be used at a moment's notice when needed. Activated charcoal and other similar adsorption deodorizers can be placed on the headrest or under the seat or in the back. These products will function the same way regardless of where you put them as long as you have them exposed (naturally, sealing them into a box won't allow the bad air from being adsorbed unto their surface). There are loads of brands and methods when it comes to air freshener types. Some of the different types of air fresheners include plug-ins to your air conditioner, beads, gels, oils, candles, and the traditional spray. For cars, you have the typical pine-scented air freshener for car that's shaped like a cartoon pine, among other products. Which one should you go with? It depends on the situation every time. 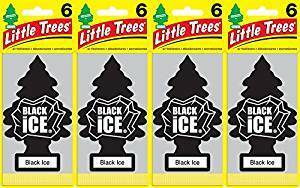 Usually, most motorists go with the Little Trees route, especially truckers because of how ubiquitous and affordable these cardboards reminiscent of scented stationary are. Other vehicle owners might prefer something short term, like a masking agent, before heading to the car wash to get a thorough vacuuming of the insides. Still others want new gimmicky scents like a "new car smell" even though their cars are many decades old already or the sweet smell of citrus. For daily malodor defense, ionic or deodorizing agents work chemically against these odor-causing germs, bacteria, and other stinky volatile organic compounds. Inorganic compounds can be adsorbed by adsorption materials like charcoal, but that doesn't work so well in a smoker's car. Dry car air that's stuffy and without humidity require the expertise of a humidifier air freshener instead. Let your situation help you find the perfect air freshener for your car.